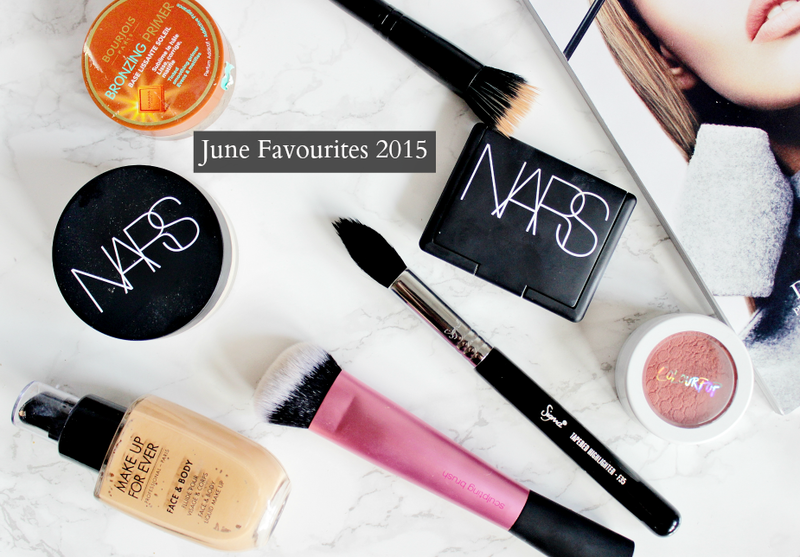 It’s JUNE FAVOURITES TIME! No skincare bits this month, I’ve been loving the same as I did last month and basically everything mentioned in my Skincare Routine. As you know I’d been doing a lot of shopping in May and now is the time I get to try out all the beautiful things! Lets get started shall we.. The base I have been slightly obsessed with is the Make Up For Ever Face & Body in 32. If you read my MUFE haul you’ll know I was hoping this would be a good alternative to MAC’s version. Well a few weeks after using this stuff I can confirm that to me at least - it’s even better. I love the consistency of this, once you’ve shaken it up it’s kinda gel like and blends into the skin beautifully. This is most definitely a light coverage, though it can be built up to a medium coverage and I’ve enjoyed applying this with my fingers as well as a buffing brush. The result is a long lasting, slightly dewy, skin-like finish which has really evened out discolouration and redness. It lasts so well in humid conditions and doesn’t fade in weird places or catch on dry patches. I will be reviewing it fully soon with the cons too, so keep an eye out for that but so far so good! The second base product that has been floating my boat is the NARS Soft Velvet Loose Powder in the shade beach. This has a yellow tone and it is so beautifully soft, the name does not lie! The powder is really finely milled yet does a great job at setting makeup and removing any excess dew. I’ve actually been using this more than my trusty Ben Nye banana powder because its a little less intense in pigment and looks less thick and powdery under the eye. The yellow tones match my stromboli skintone perfectly and a little goes a long way - I’m super happy that I picked this up! My favourite brushe to use this with is the Sigma Tapered Highlight - F35 reviewed here which I previously only used to actually highlight, but it is seriously one of the best setting brushes ever. The top is so precise (though it looks a little ruffled above but that's only because it was freshly washed) and it gets right into the corners of the face. I don’t normally set my whole face, just under my eyes, around my mouth and my nose and this brush makes it easy to put the powder where I need it. 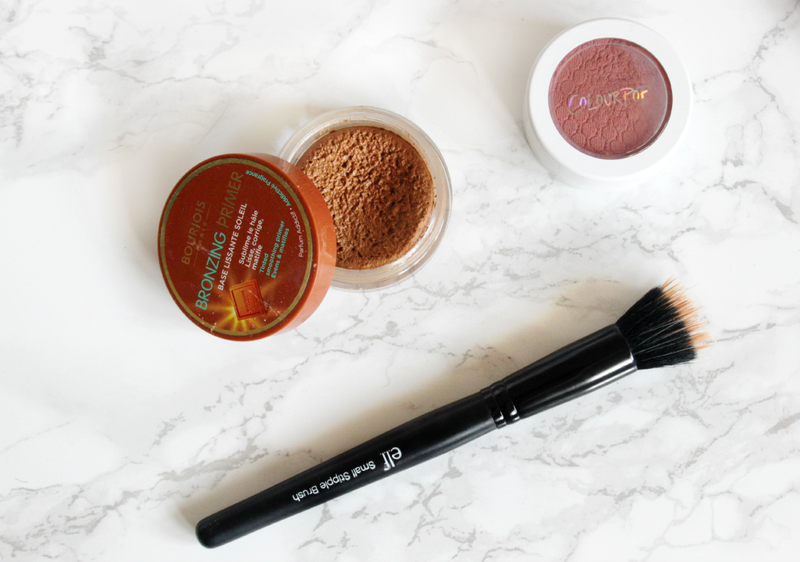 As the warmer weather has started in the UK I’ve been loving using lightweight cream products, especially the Bourjois Bronzing Primer which is very similar to the Chanel tan de soleil in my opinion. Though it has a much more mousey texture, it warms up the skin so beautifully and the texture means it blends on top of foundation, CC cream, even just moisturiser so well! It adds warmth and though it is an orange tone when blended in with a stippling brush it does a great job at adding real warmth like you've been sunkissed. I sometimes put this on before my base and it looks even more natural. The brush I’ve been using with this is the E.L.F Small Stipple Brush which is perfect for blending out bronzer and cream contour! It is also great for applying cream highlight precisely where you want it and of course for blusher - the size of this is perfect and I’m hoping E.L.F open up again quickly in the U.K because I need at least two or three of these! Keeping along the kinda cream theme, I have been loving the Colour Pop Blush in ‘Between The Sheets’ which is a GORGEOUS matte dusty pink which just looks so complimentary to any look, be it no makeup makeup or a smoky eye! I was watching the beautiful Heidi Hamoud’s video here and she said she loved the colour and it looked like such a beautiful 'pulled together' shade for medium skintones. Side note - how flawless is her eyemakeup in this video?? Really want to try this look for the next special occasion..perhaps Eid? ^_^ The texture of the blush is odd - the word squishy comes to mind, it is nowhere near a powder but not a cream either and I’ve been applying it with either fingers or the E.L.F brush mentioned above. The shade of the blush isn’t similar to anything I already own and it reminds me a little of NARS Madly, just that kinda nudish effortless cheek colour. Plus the fact that it’s matte means you can go extra cray with the highlight y’know? I don’t like to keep going on and on about products but when they work well, I just have to share it more than a few times..one of those is the Too Faced Chocolate Soleil Bronzer in Medium-Deep! 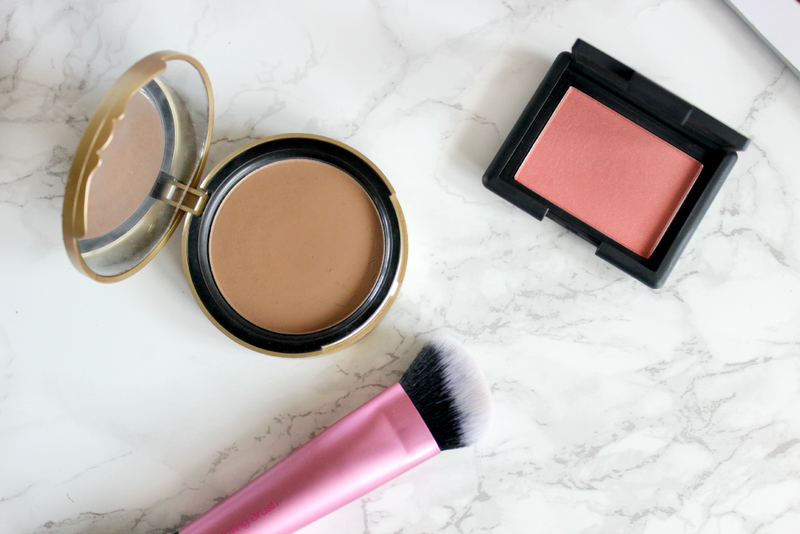 It is my go to bronzer for contouring and adding warmth too, if I have five minutes to get ready, a quick sweep of this bronzer on my cheekbones and it makes the biggest difference. Also I can’t express how lovely the smell is! Especially when one is fasting tehehe. I use with the RT contour brush or the new Real Techniques Sculpting brush which I shared with you guys in this post here. 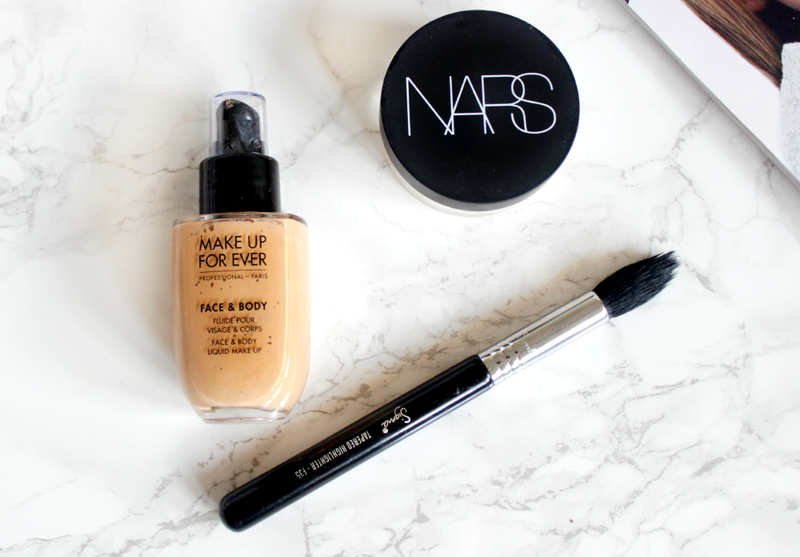 It’s perfect for getting a quick sculpted look without much effort and actually it’s awesome for blending out cream products too as well as liquid. I recommend everyone picks one of these up if they’re after a good quality sturdy contouring brush. The blush I have been loving aside from ‘between the sheets’ is NARS Torrid. It is one of the most perfect shades for medium skin-tones - the best peachy pink with light flecks of shimmer which transfer on the skin as a stunning healthy glow. It’s not as crazy shimmery as their most iconic O blush, nor is it as sheeny as my favourite D.T - it could be almost matte but for the small speckles of golden glimmer. 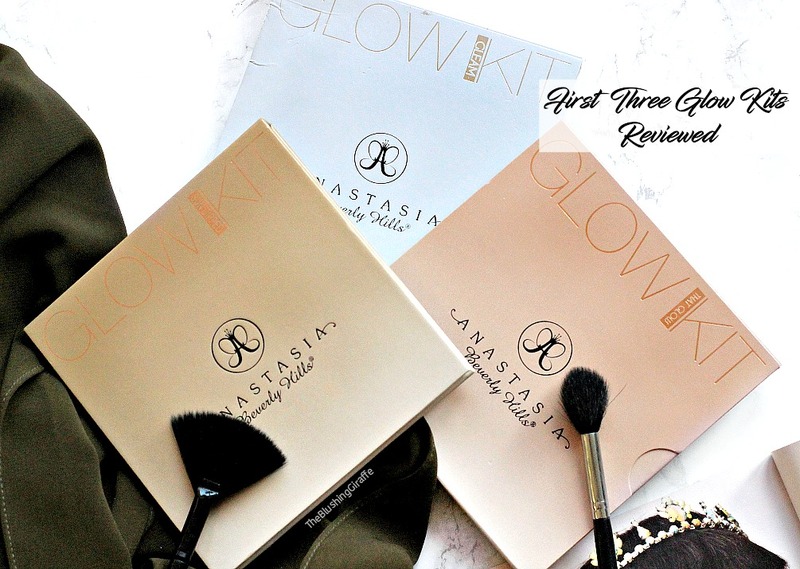 An olive skin tone must have shade and another product I need to give you a full review of for sure!